Every year more than 100 people lose their lives in forklift incidents, and thousands more are injured. Forklift tipovers are the leading cause of fatalities involving forklifts, representing about 25 percent of all forklift-related deaths, according to OSHA. Today is National Forklift Safety Day, sponsored by the Industrial Truck Association. The day serves as a focal point to highlight the safe use of forklifts and the importance of operator training. Failure to provide or ensure use of seat belts. 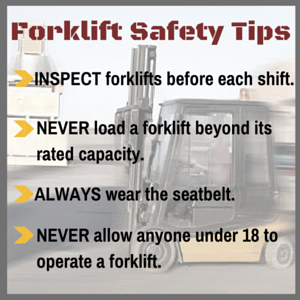 Inspect forklifts before each shift. Never load a truck beyond its rated capacity. Always wear the seat belt. Slow down and sound the horn at intersections or other location where vision is obstructed. Never allow anyone under 18 years old to operate a forklift. Ensure that only trained and certified forklift operators are allowed to operate the equipment. BLR has many resources to help you set up an effective forklift safety program and train your operators. Click the links below to see a sample of our offerings.